Spring break is NEXT WEEK! Spring break week begins this Monday, March 30th and runs through Monday, April 6th. School will resume on Tuesday, April 7th. 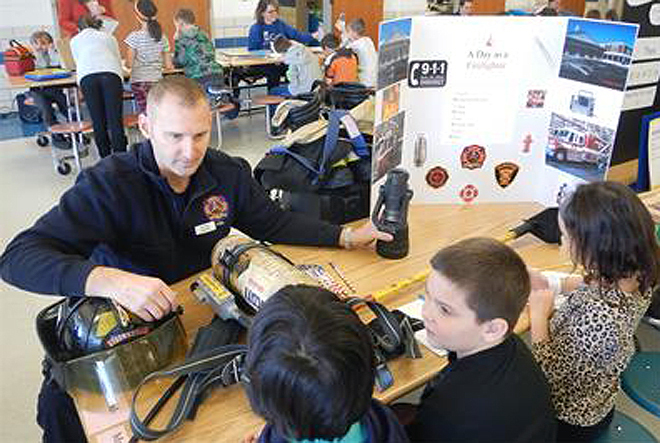 Falls-Lenox third-grade students participated in the school’s annual Career Day February 27th. The school welcomed 40 volunteers from a variety of different professions. Students enjoyed hearing about the volunteers’ careers that related to goods, services and competition. They also were fascinated with learning about all the different aspects of the careers. The school gives a big “Thank You” to all of the volunteers for making Career Day a hands-on learning experience for the third graders. To view a photo gallery of the event, click HERE. Coach Dan Largent fielded six questions from a Northeast Ohio Media Group reporter that appeared in the paper and online recently. He is in his sixth year as head coach with the Bulldog baseball team and 15th year with the baseball program. To view the online story, click HERE. 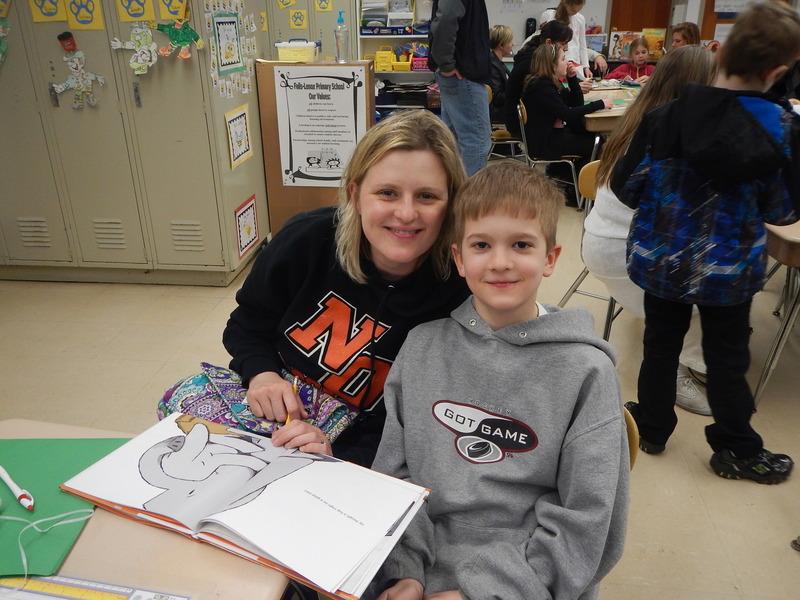 Falls-Lenox Primary School’s first-, second- and third-grade students and their families celebrated reading with jungle-themed Literacy Night events. The exciting evenings of learning were filled with parents working with their children on fiction literary elements, non-fiction text features and practicing reading skills through various websites and apps. 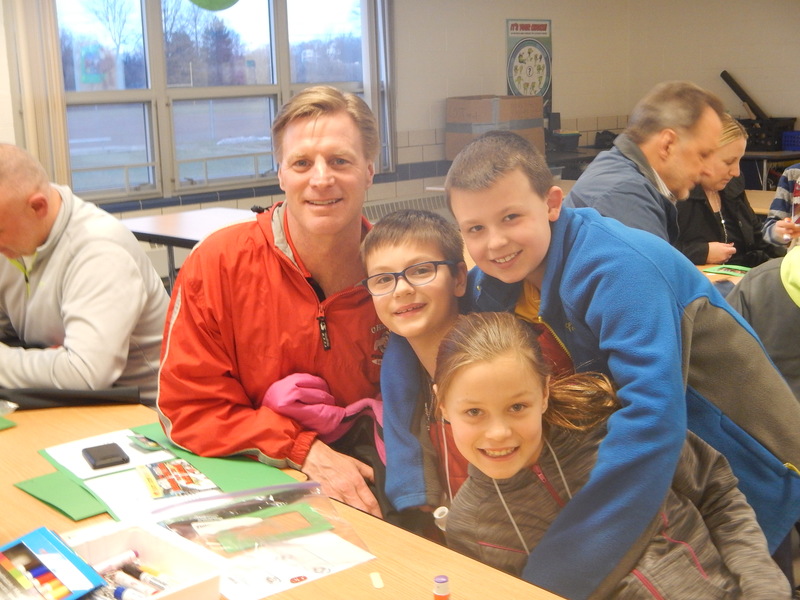 Students and parents participated in three make-it-take-activity stations. Students left each station with an activity they could take home to practice with their favorite books. Each student also received a book to take home, donated by the Falls-Lenox library, information about Info Ohio and an extensive list of educational websites and apps. A special “Thank You” to all the families who participated and learned more about supporting reading at home. Cleveland State University is hosting Spring Break, a new series of events from March 30 through April 10 that will feature a different academic program each day. Students will hear a presentation on the featured program, such as the College of Business featuring its business majors, and then have an “academic experience,” such as a mock class. Here is a list of the scheduled times and programs. Friday, April 10th – Exploratory & First-year advising. To view a link to registration and schedule, click HERE. 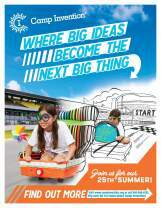 DON’T FORGET TO SECURE YOUR SUMMER SPOT AT CAMP INVENTION ! Are you curious? Are you a gadget maker or taker-apart? Do you and your friends like to create and build? Camp Invention may be for you! Camp Invention is an innovative, week-long summer camp that provides students in grades 1-6 with a hands-on, interactive program that the Inductees of the National Inventors Hall of Fame inspired. Camp Invention will run from June 8-12th from 9 a.m. to 3:30 p.m. daily at Falls-Lenox School. To view the online flyer, click HERE. Registration is online at www.campinvention.org. Scholarship funds are available. If you have a financial need, please contact us so we can help you join us at camp. Questions? Contact Camp Invention Director Michelle LaGruth, mlagruth@ofcs.net. Are you doing some Spring cleaning this month? How about recycling your gently-worn coats, shirts, pants and other items to the OFIS Green Team’s Clothing Recycling Drive? Place the clothing in a bag for the drive that runs from April 13th–17th. The purpose of this program, which is in cooperation with Goodwill and the Cuyahoga County Solid Waste District, is to educate students on the importance of reusing and recycling, while supporting Goodwill’s mission of improving the quality of life and employment opportunities for people. To view a flyer, click HERE. Helping Hands is offering a free Movie and Game Night from 6-8:30 p.m. Friday, April 10th at Olmsted Falls High School. R.S.V.P. by Wednesday, April 8th to mkrakowiak@ofcs.net. If you cannot attend, please check out HH blog for future events at helpinghandsofcs.wordpress.com. To view more details, click HERE. Helping Hands is a disability awareness program hat helps people of al ages learn attitudes of acceptance, dignity and respect toward all, especially those with disabilities. The program will help you and your child discover new friends. Move and Game Night is a “sensory friendly” experience. The sound is controlled and the lights will be dim (not off). Short films will play so students can feel comfortable changing scenery from auditorium to cafeteria as needed. Everyone is welcome. Games will be played in the cafeteria. Feel free to bring your favorite game to share. Helping Hands will provide pizza, snacks and water. The rescheduled combined meeting of OFIS PTA and Falls-Lenox/ECC PTA is on Tuesday, April 21st. OFIS PTA welcomes all parents of current third graders to the OFIS cafeteria at 6 p.m. for dinner and a tour of the school. Principal Mr. Svec will be there to answer questions. The combined meeting of OFIS and Falls-Lenox/ECC PTAs will follow at 7 p.m.
For the latest news from OFIS PTA, follow us on http://www.ofispta.wordpress.com, www.facebook.com/OFISPTA and www.tritter.com/OFISPTA. United States Service Academy Seminars Sponsored by Senators Sherrod Brown and Rob Portman. Interested in learning more about the application process for the Air Force, Military, Naval and Merchant Marine Academies? Join us for an informational session. Saturday, April 25, 2015. Horizon Science Academy. 6000 South Marginal Road, Cleveland, OH 44103. 10:00 AM – 12:00 PM. Please RSVP if you are planning to attend by calling an Academy Coordinator at 1-800-205-6446 or 1-888-896-6446 then press 1. 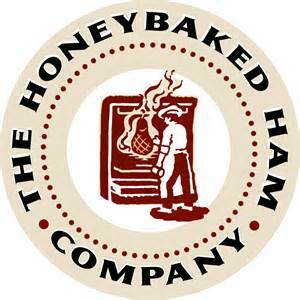 TODAY IS LAST DAY TO ORDER HONEYBAKED HAM! 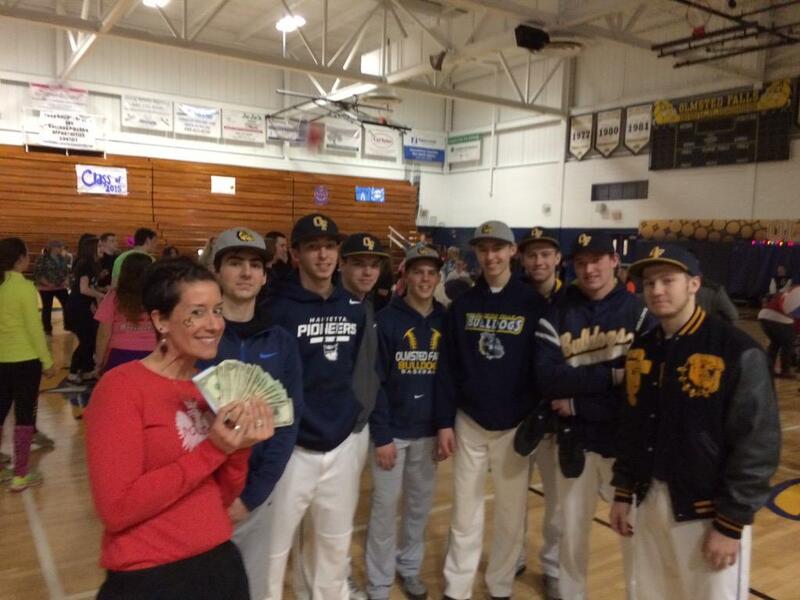 The OFHS Swim and Dive Team presents its Spring 2015 HoneyBaked Ham Sale. The online orders are available until TODAY – March 27th. To order, go to http://honeybakedfundraiser.com/f-1134-Olmsted-Falls-High-School-Swim-and-Dive-Team.aspx. Proceeds go to the swim and dive team. Pick up is from 4-7 p.m. April 2nd @ the OFHS band entrance. Call Anita Greller, 440-793-6405 with any questions. Falls-Lenox invites all to attend its A Carnival for a Cure from 6-9 p.m. Friday, April 24th. The carnival supports the American Cancer Society’s Relay for Life. All proceeds from the carnival benefit the ACS June 6-7 2015 Olmsted Relay for Life through the Falls-Lenox for a Cure Team. Have fun, play games, walk for a cure and challenge your principal. Enjoy a $5 dinner choice of hot dog or pizza, chips and a drink. Walk a mile or more and earn lap beads. To view a flyer of the event, click HERE. Students must be accompanied by an adult. 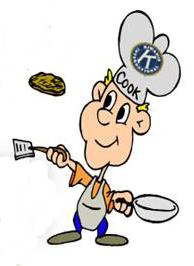 THIS SUNDAY, MARCH 29TH – KIWANIS PANCAKE BREAKFAST WITH THE EASTER BUNNY! Join the Olmsted Falls Kiwanis Club for its annual Pancake Breakfast with the Easter Bunny! This year’s event is scheduled for THIS Sunday, March 29th from 8 a.m. – 12:30 p.m. in the Olmsted Falls High School Cafeteria. All you can eat pancakes and french toast, plus sausage, juice and/or coffee. Tickets will be available at the door and also at First Federal of Lakewood at 26908 Cook Road in Olmsted Township. Tickets are only $6 each and EVERY meal ticket purchase is automatically entered into a drawing for a chance to win a Kindle Fire HDX! (You don’t have to be present to win.) All proceeds benefit our local communities. Kids under 3 eat free. Pictures with the Easter Bunny, plus Chinese Raffle Prizes! Don’t miss this great community event! 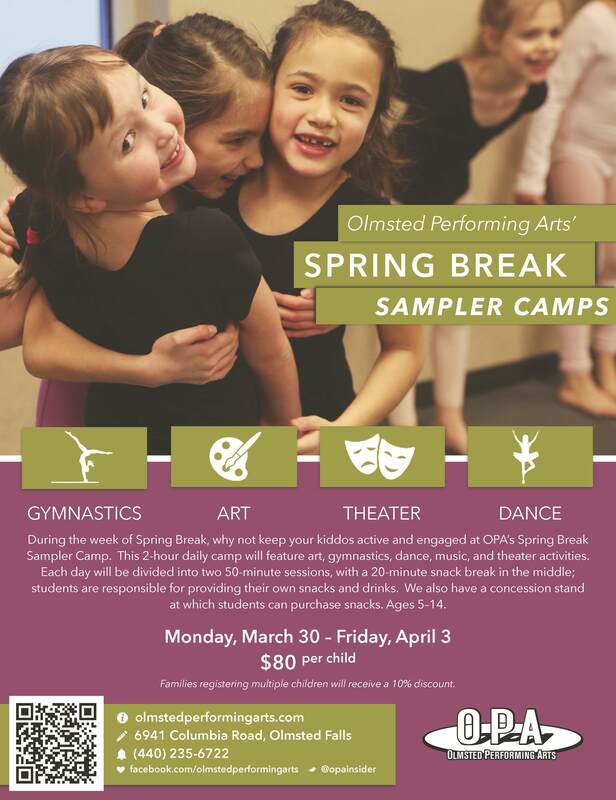 From 3/30-4/3 – the week of Spring Break – why not keep your kiddos active and engaged at OPA’s Spring Break Sampler Camp. This 2-hour daily camp features art, gymnastics, dance, music and theatre activities. Each day is divided into two 50-minute sessions, with a 20-minute snack break in the middle. Students are responsible for providing their own snacks and drinks. Families registering multiple children will receive a 10-percent discount. To view a flyer, click HERE. Polaris Career Center invites all to its Career Day Wednesday, April 1st, from 9 a.m. to noon at its Middleburg Heights location on Old Oak Boulevard. This free event, which is designed to foster a competitive and productive workforce in Northeast Ohio, will provide a vital link among employers, job seekers, community groups and government agencies. The 99 employers have many full-time positions representing a variety of industries from manufacturing, health care, construction, sales and service. Local agencies and Polaris representatives will be on hand to provide access to educational resources, financial aid and much more. To view a list of the employers that will be present, click HERE. Online registration for the Spring 2015 Olmsted Falls Soccer Association’s is occurring now. To register, go to www.olmstedsoccer.com. DEADLINE TO REGISTER IS APRIL 3RD! Practices begin the week of April 13th and play, from April 18th through June 6th. Teams practice one day a week with games on Saturdays. Players must be 4 years old by April 18th. Divisions available are preschool, pre-k, kindergarten, grade 1, grade 2/3, grade 4/5, junior high and high school. This recreational program is a community league with an emphasis on instruction. It is open to all Olmsted Falls, Olmsted Township and surrounding community players from age 4 through grade 12. Teams are organized by age and grade, coaches by volunteer parents and assigned randomly. 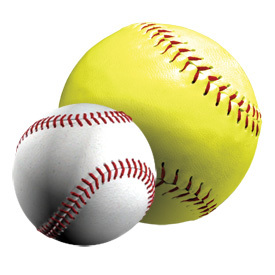 Olmsted Community Summer League is accepting registrations for baseball/softball without a late fee until March 31, 2015. Late registrations with a $20 fee will be accepted until April 15, 2015. To register, visit the Olmsted Community Center website at http://www.olmstedcc.com. 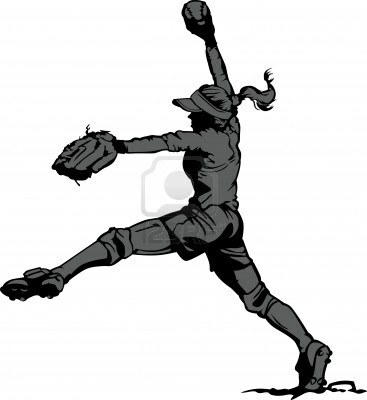 OCSL is excited to introduce our new Travel Slow-Pitch Softball league for our Girls Intermediate division ages 9-11. Half the games will be played in Olmsted Falls while the other half will be played in Middleburg Hts and Brookpark against their girls Junior League ages 10-12. If you have any questions about this new travel league then please contact league rep Shelly Bernes at slbernes@aol.com. Please register soon for all of our boys/girls and adult leagues before registration closes. Introduce preschoolers, ages 2-5 to ballet and creative movement with these great classes on Thursday mornings: Dancing Ballerina’s (ages 2-3) 9-9:45a.m., Dancing Fairies (age 4) 10-10:45a.m., and Dancing Stars (age 5) 11-11:45a.m. 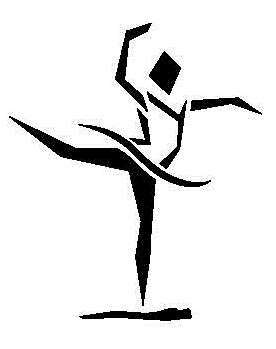 Dance classes begin April 9th for a 6-week session held in the dance room at the Olmsted Community Center. For more details, call the OCC at 440-427-1599 or register at www.olmstedcc.com. The Falls Pointe Swim Team registration is from 2-4 p.m. Sunday, April 19th. It is open to any Olmsted Falls or Olmsted Township resident. Team members love to have fun as much as they love to swim. It’s guaranteed your kids will have a blast this summer. Some fun activities include Donut Fridays, a pancake breakfast, weekly contests with prizes and an awards picnic and pool party. It is a low pressure environment for swimmers of all skill levels. The only requirement is that you must be able to swim independently across the pool. For more details, go to its website by clicking HERE. Neighbors and friends of the Moilov family have organized a community fundraiser to support this local family who lost their mother suddenly in February. All are invited to attend the “Moilov Children Fund for the Future” event scheduled for Friday, April 24th from 7:30 – 9:30 p.m. at Razzles. Cost is $20 per person and includes wings, pizza, desserts and beverages. Event also includes: side boards, 50/50 raffle, door prizes and a live DJ playing all your favorite tunes! Your support is needed! Bring friends! For tickets, please call Randy at 440-552-8323. Join coach Roger Hutkay for Power Athletes Spring Speed & Agility Camp at the Olmsted Community Center. This youth camp is open to boys and girls ages 10-16. 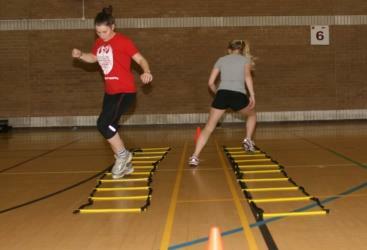 It will provide a wonderful opportunity for campers to improve speed, agility, strength, explosive power, balance and coordination; ability to accelerate, decelerate, change direction; and overall running form and mechanics. When: Tuesdays & Thursdays 6:00-7:00 pm. For additional camp details, examples of activities, and registration link, please click HERE. Applications are now being accepted for Baldwin Wallace University Summer Music Programs. For students in grades 4 – 9 (application deadline: May 1) String Camp, June 13 – 18 Piano Camp, June 13 – 18 Band Camp, June 20– 25 Music Theatre Camp, June 20 – 25 For high school students (application & audition deadline: April 1) International Guitar Festival, May 16 – 17 CSI: Conservatory Summer Intensive, July 12 – 25 Music Theatre Overtures, July 19 – 24 Go to www.bw.edu/summer-music-programs for more details and applications. At its regular monthly meeting held last Thursday, March 19th, the Olmsted Falls Board of Education voted unanimously to pass two separate resolutions relating to the Common Core Standards and the new State Mandated Assessments, respectively. The first resolution asserts the Board’s support of the new common core standards, adopted by Ohio and 43 other states across the country. The second, separate resolution, communicates the Board’s opposition to the current accountability model, which mandates an excessive level of testing/assessments for students in Olmsted Falls Schools, and across the state of Ohio. “However, as a Board, we also believe that the over-testing that has been mandated by the state to measure the effectiveness of districts throughout Ohio is too much and needs to be changed,” Mr. Weisbarth added. To view the Olmsted Falls Board of Education resolution in support on the common core standards, please click HERE. 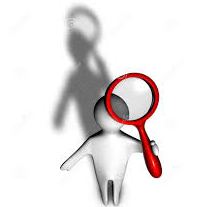 To view the Olmsted Falls Board of Education resolution in opposition to the current accountability model / excessive level of assessments, please click HERE. 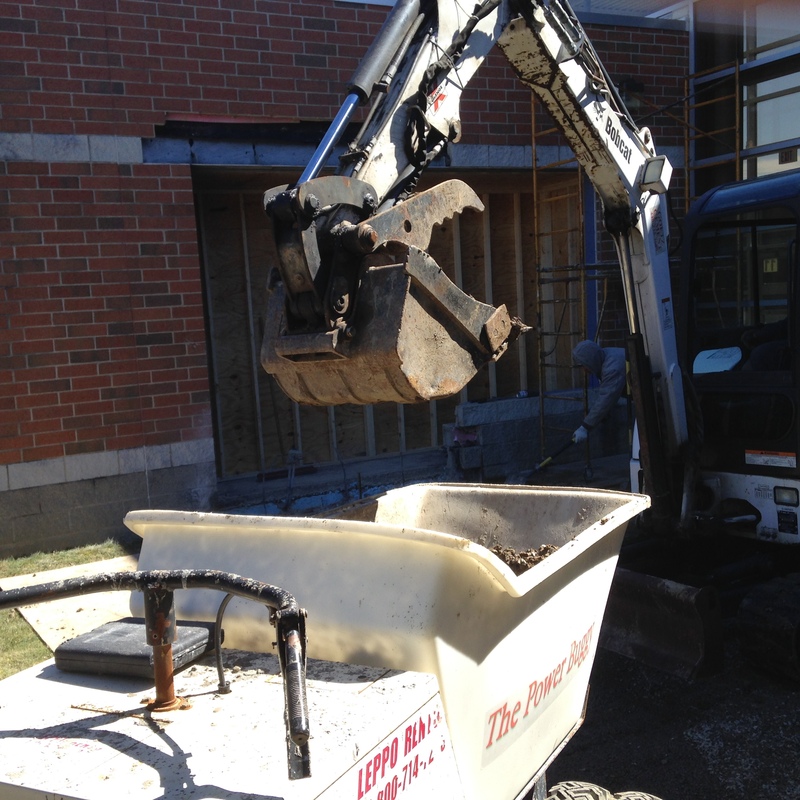 Construction is officially underway to improve the security of the main entrance at Olmsted Falls Middle School. The new renovations include reconfiguring the main building entrance so that visitors entering the building do so directly through the main office. Currently, visitors entering the building during school hours are buzzed in through vestibule doors that lead into the main hallway, and then need to walk down the hall to check in at the office. Once the renovations are complete, visitors will now enter the building through a new vestibule that leads directly into the Middle School’s main office. 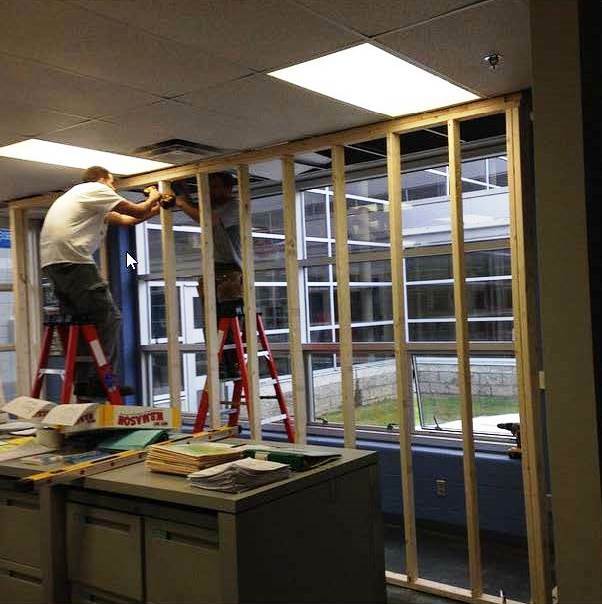 The reconfiguration began with a new doorway being cut through the wall located on the outside edge of the main office, just to the east of the existing entry doors. A new vestibule is now being constructed surrounding this new entry point, and will include video surveillance and a buzzer system for controlled entry. Concrete will be poured to extend the existing walkway and a canopy will also be installed. This important renovation project is anticipated to be completed by the end of May. Funds from an existing permanent improvement levy dedicated exclusively to Olmsted Falls Middle School are being used for this project, in addition to a $5,000 Entrance Security Grant awarded to Olmsted Falls Middle School through the Olmsted Facilities Construction Commission. In all, Olmsted Falls School District has been awarded a total of $25,000 in Entrance Security Grants by the OFCC ($5,000 for each building) to improve safety and security. The National Association of Music Merchants (NAMM) Foundation has announced that Olmsted Falls School District made the list of 2015 Best Communities for Music Education. This prestigious designation honors districts for outstanding efforts by teachers, administrators, parents, students and community leaders that make music education a priority. Best Communities for Music Education affirms school districts that have demonstrated exceptional efforts toward maintaining music education as part of schools’ core curriculum. NAMM evaluates schools and districts based on funding, staffing of highly qualified teachers, commitment to standards, and access to music instruction. Olmsted Falls School District is one of just 388 districts across the nation that received the honor this year; this is the ninth consecutive year it has received this honor. Congratulations to staff, students and the community for supporting music education in our schools! Olmsted Falls High School Concert Band, Symphonic Band, Treble Choir, Wind Ensemble and Chorale competed March 13th and 14th at the Ohio Music Education Association Large Group Adjudicated Event for High School Band and Choir. In unprecedented school history, four of the five ensembles that competed qualified with a superior rating, advancing them to State level competition. Congratulation to all students who participated! We are very proud of you. Upcoming OFHS music events include April 17: ProMusic Festival/Competition at Tiffin University-Golden Expressions; April 24/25: Big Fish-Spring Musical; May 1/2: State Choir/Band Competition; May 7: Spring Band Concert; May 14: Pops Concert (choirs); May 25: Memorial Day Parade; May 27: Baccalaureate Ceremony and May 28: Commencement Exercises. OFMS POWER OF THE PEN TEAMS MAKE THEIR MARK! On Saturday, March 14, the 7th and 8th grade Power of the Pen teams traveled to St. Joseph Academy for the second creative writing tournament of the season. Both teams had a fantastic day! The 7th grade team won 1st place and 8th grade took 3rd place. Together, the 7th and 8th grade teams also took home the coveted Sweepstakes trophy! Congratulations to the Power of the Pen teams for their tremendous successes at Regionals! 7th graders: Emily Kasl, Kayla Kippes, Nicole Latona, Rhiannon Lloyd, Kristen Miller (who came in 4th place and won a Best of Round award! ), Ashley Rice (who came in 13th place! ), Neil Spooner and Summer Stevens. 8th graders: Emma Andrus (who came in 2nd place! ), Jamie Bridle, Lauren Gumeny (who won a Best of the Best award! ), Morgan Luke, Cameron Nelson, Ally Rice, Jillian Scott and Victoria Steiert. Special thanks to Mr. Gumeny for photographing this event! 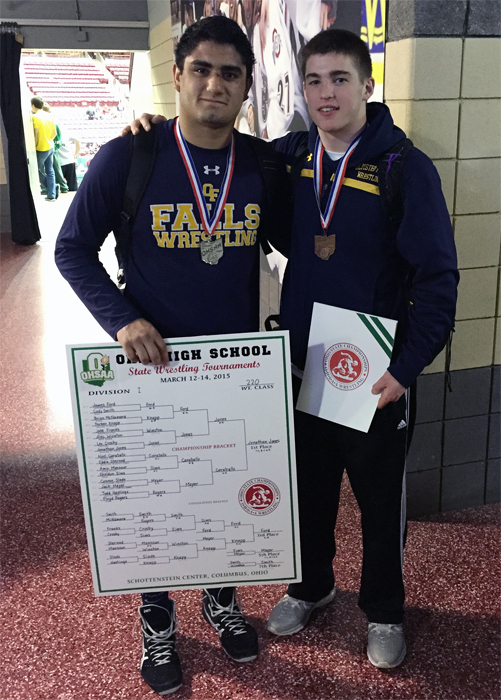 Noel Caraballo and Brice Locklear competed in the OHSAA State Wrestling Tournament. They both earned All-Ohio ranking. Noel began the tournament with three straight wins, catapulting him into the OHSAA State finals. He was the 15th wrestling in OF history to reach the State Finals match. He was the aggressor the entire match, but surrendered a takedown in overtime – falling just short of a championship. He finished as the 220-pound Division 1 runner-up and had a 51-3 record. After losing his first match to the eventual State Champ, Brice rattled off four straight victories, earning the chance to wrestle for third place. He fell just short in his final match, but he still came away with a fourth-place finish in the 152-pound weight class in Division 1. He ended his season with a 53-5 record. 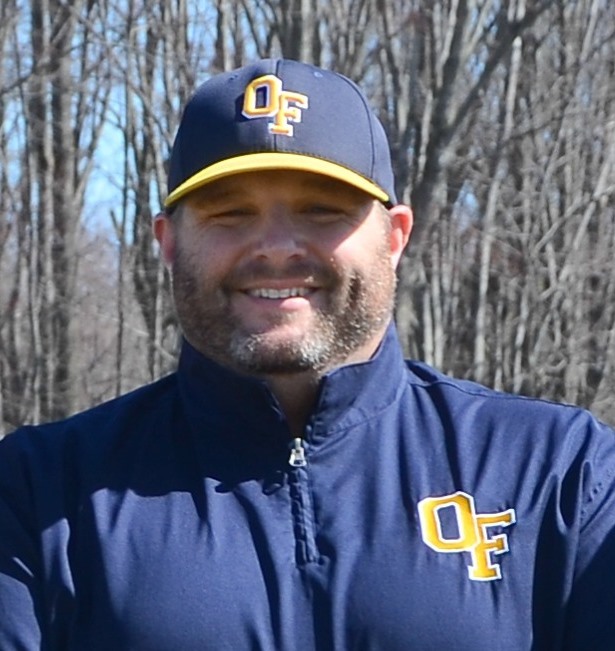 His 53 wins are the most wins ever in a season for Olmsted Falls. Brice and Noel’s performances helped our OFHS wrestling team finish in 16th place, breaking the top 20 in the state for the first time since 2004. Congratulations to OFHS basketball player Kerri Gasper who was named to the 2nd Team All-Ohio. The senior earned the accolade this year while averaging the following stats per game: 15.8 points, 9.2 rebounds, 1.8 steals, 2.2 assists and 0.3 blocks. She also shot 82 percent from the free throw line. Kerri scored her 1,000th career point this season and scored 1,154 total points in her career. She will play in the GCBCA All-Star game at 7:15 p.m. March 31st at Rocky River High School. Kerri will continue her basketball career while attending the University of Evansville in southern Indiana. Good luck, Kerri. The eighth-grade boys conference basketball team produced a great season and won the 2015 SWC Championship. The Bulldogs recorded a perfect 14-0 record in the conference, including two exciting victories in the post-season tournament. Throughout the season, the boys exhibited great teamwork as well as an ability to overcome adversity. This “never give up” attitude helped the team in its come-from-behind wins in both tournament games. In the Championship game, the Bulldogs overcame a 14-point deficit in the second half to beat Berea, 49-47. Team members area (bottom row) Teddy Grendzynski, Chuck Backus, Michael Fritz, Drew Higginbotham, Jack Spellacy, (top row) Ryan Higginbotham, Austin Stefan, Sam Lofton, Dylan Reines, Braden Galaska, Gavin Dietrich, Eric Hanna and Coach John Holzworth. Congratulations on an exciting season. 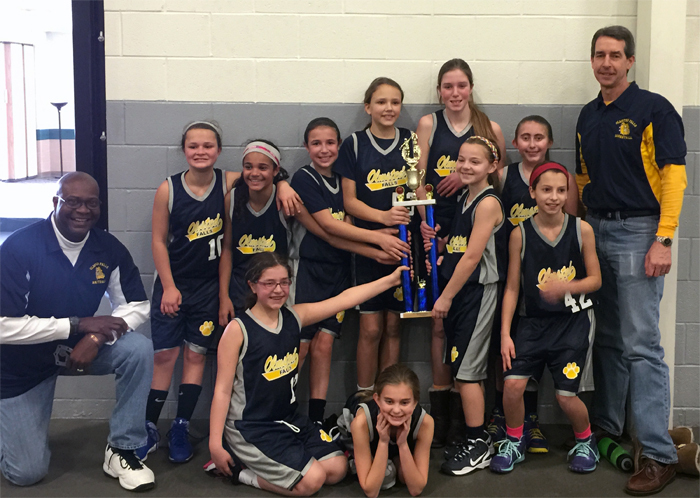 The Olmsted Falls Intermediate School girls fifth-grade basketball team are regular and playoff champs! They earned a 13-0 season and are Lake Erie Basketball League champs in their division. Congratulations to players Lauren Noerenbreg, Aubrey Martinez, Madison Sagerman, Ashley Zelenskas, Delaney Bielski, Aubrey Thiel, Christina Cox, Katie Voisinet, Mallory Olitsky, Sara Glover and coaches Mike Thiel and Monte Cox. 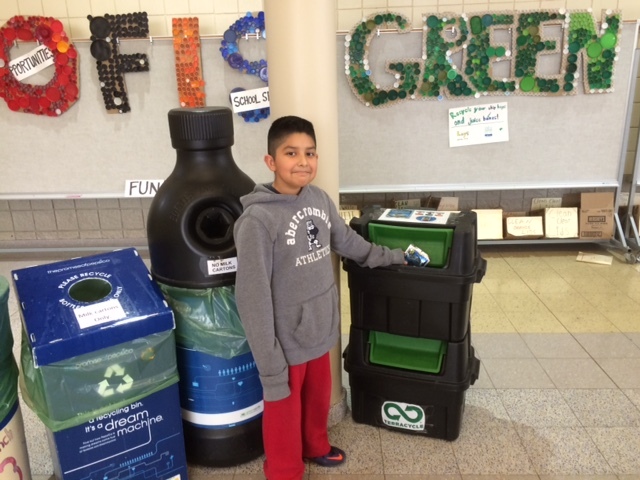 The Green Team at Olmsted Falls Intermediate School has been very active this year. You will see one part of that effort soon emerging from the ground. Students planted hundreds of flower bulbs – and three trees – outside the school’s main entrance. They also recycled thousands of juice pouches and chips bags and promote Waste Free Wednesdays where students have reduced the lunch time waste from 280 pounds to less than 200 pounds on most days. They also created hundreds of bookmarks made from reused cereal boxes and are reusing thousands of plastic lids on several craft projects. 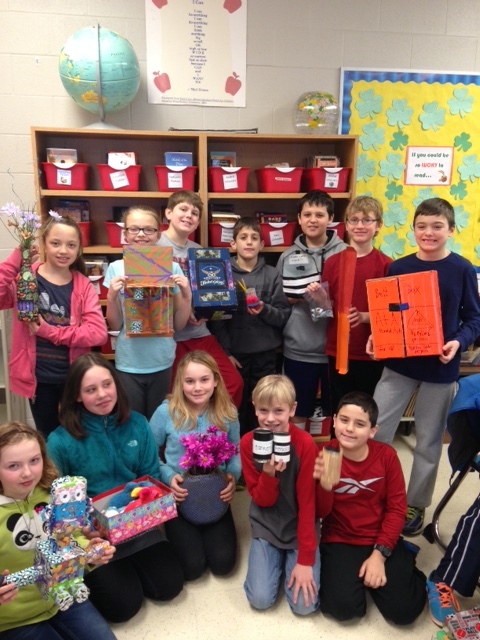 Students are gearing up for Earth Day next month by having an April 15th Zero Waste Lunch, planting flower seeds in reused plastic egg cartons to plant later in the front entrance garden and sponsoring a Goodwill clothing drive, which can be found in a separate blog item. You can help the Green Team by sending your juice pouches, chip bags, clean plastic lids and plastic egg carton containers to OFIS. We appreciate your support. 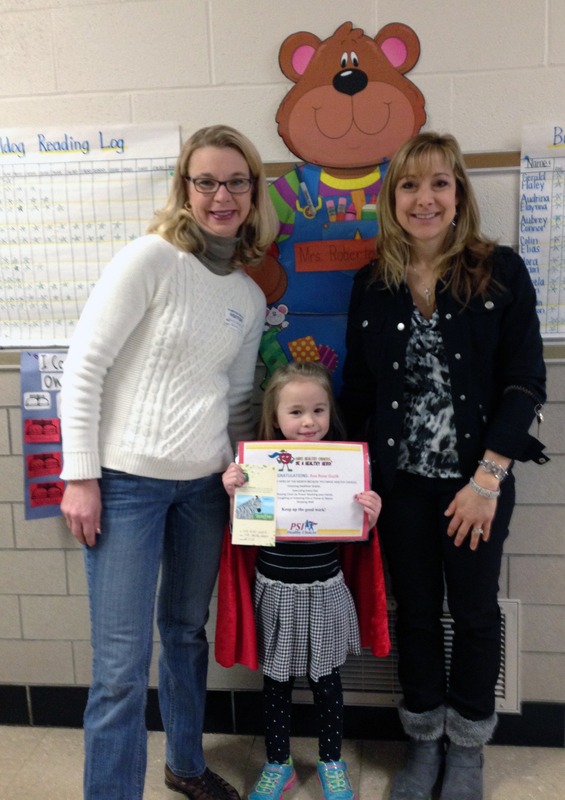 Congratulations to Mackenzie Stevens, the Falls-Lenox Healthy Hero for February. The first grader is pictured here with Lisa Bartsche, the school’s library assistant. Healthy Hero teaches kids healthy habits, such as eating properly, power washing hands, daily exercise, coughing and sneezing into one’s sleeve and sleeping well. The Hero earns a prize for doing healthy tasks at home, too. Each month one Healthy Hero from ECC and Falls-Lenox are selected from a drawing and receive a Toys-R-Us $5 gift card. Students who have placed into College Credit Plus courses based on COMPASS, ACT or SAT scores have one more opportunity to attend a group scheduling meeting with a parent. The final meeting is MARCH 26th at 6:00 p.m. in the OFHS library. At the meeting we will review College Credit Plus in more detail and how the college courses work in a student schedule. Current PSO students need not attend this meeting and will meet with their grade level counselor. For more details, contact Aimee Caldrone, college and career counselor, at 440-427-6152 or acaldrone@ofcs.net. Spring break week begins this Monday, March 30th and runs through Monday, April 6th. Olmsted Falls Middle School homerooms are competing for a delicious lunch from Olive Garden. 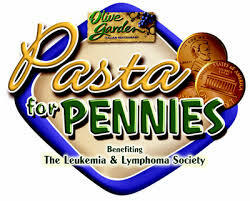 The “Pasta for Pennies” competition is now occurring through March 27. 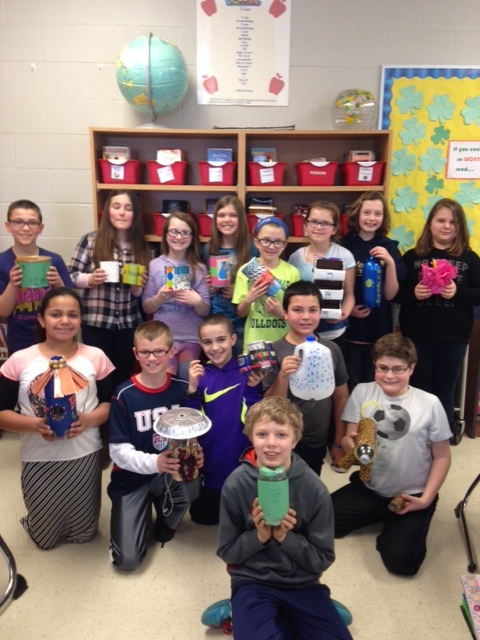 Students are collecting monetary donations to raise money for the Leukemia/Lymphoma Society. The winning homeroom will enjoy a lunch complete with salad, pasta and breadsticks that Olive Garden will serve. If you are interested in donating to this cause, visit the school’s fundraising page by clicking HERE. Are you doing some Spring cleaning this month? How about recycling your gently-worn coats, shirts, pants and other items to the OFIS Green Team’s Clothing Recycling Drive? Place the clothing in a bag for the drive that runs from April 13th-17th. Helping Hands will visit the Ronald McDonald House on Thursday, April 2nd, which is during Spring break. We will take a prepared meal to the residents. Having regular meals provided help families in many ways. It eliminates the burden of making time to prepare food, thus allowing families to spend more time with their hospitalized child. It also removes the financial hardship of buying groceries or eating out and offers healthy options for families. We will also drop off the aluminum pull tabs that were collected this school year. If you regularly collect pull tabs and would like us to drop them off for you, please mark them “Helping Hands” and drop them off at OFHS by Friday, March 27th. They collect aluminum pull tabs from any container (soda pop, soup, pet food, etc.) and work with a local recycler to turn the tabs into money for their Family Fund. This fund helps support the families who stay at RMH by providing meals and items for families, assistance in emergencies and giving families special moments – like small gifts for children if they have a birthday while at the House. Last year more than 15,000 pounds of pull tabs generated over $7,500 for RMH! Click HERE for a pull tab collection label if you would like to collect tabs for us through March 27th. 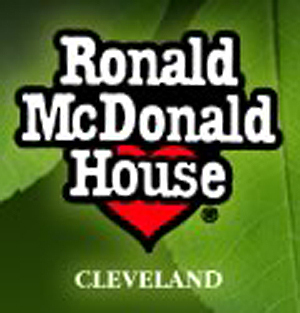 Thank you for supporting our local Ronald McDonald House. ORDER YOUR HONEYBAKED HAM THROUGH ANNUAL OFHS SWIM/DIVE TEAM SALE TODAY! The OFHS Swim and Dive Team presents its Spring 2015 HoneyBaked Ham Sale. The online orders are available until March 27th. OFIS 5th grade science students in Mrs. Atkins’ class were offered an extra credit assignment. They were to create an Upcycled project. Instead of throwing everyday items away, like tissue boxes, 2-liter bottles, cans, etc. the students were to REUSE the items and turn them into something useful. They created banks, desk organizers, bird feeders, vases, and many other unique things. The students learned that many things people consider trash can actually be turned into something useful and help conserve our resources!! Falls-Lenox third graders have been working on their research and writing skills. They prepared their research presentation and dressed up as their famous person for the Wax Museum. Parents and guests visited various ‘wax museum’ presenters and heard about their lives and accomplishments. 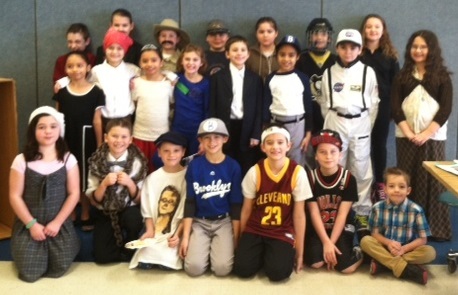 The third graders had a lot of fun learning about their famous people and sharing their research reports. To view the Wax Museum photo gallery, please click HERE. A big “Thank You” to all who attended the Early Childhood Center Book Fair. There were many Itty Bitty Bulldogs in attendance at the family night. There was even a guest appearance by Clifford the Big Red Dog and his friend, Emily Elizabeth! What a great way for parents to encourage literacy and help their children to become life-long readers. A special thanks to the Falls-Lenox/ECC PTA for providing great volunteers who helped work the Fair all week. ATTN: HIGH SCHOOL PARENTS – IMPORTANT REMINDERS ABOUT OGT WEEK & LATE START SCHEDULE NEXT WEEK! The Ohio Graduation Tests (OGT) will be administered next week (March 16-20, 2015). All 10th grade students will be required to attend each day of the OGT testing. Students are to report to their assigned homeroom promptly by 7:30 a.m. Students who are retesting will receive a letter from Guidance and will be reporting to the Media Center. Students must pass all five sections of the test (Reading, Writing, Mathematics, Citizenship and Science) in order to receive an Olmsted Falls High School diploma. Students have received OGT test preparation since their freshman year as part of their language arts, social studies, science and math classes. Students may also utilize the Ohio Department of Education website for additional OGT test preparation. The following web address in parentheses will give your student access to the resources from the Ohio Department of Education that will aid in preparation for the tests. (http://education.ohio.gov/Topics/Testing/Ohio-Graduation-Test-OGT). Students in ninth grade must report to school by 7:26 a.m. for the PARCC Language Arts Test being administered on Monday, Tuesday and Wednesday. All ninth graders will be given room assignments by their Language Arts teacher this week. During OGT week, students in grades 11 and 12 need to report to school no later than 9:55 a.m. when Homeroom will begin. The first run is the normal AM HS pick-up, which will transport ninth and 10th graders and any other students needed to arrive at OFHS by 7:30 a.m. for OGT. Students involved in OGT testing or PARCC Assessments should plan to be at their regular bus stops at their normal a.m. pick-up time. The second morning run (10 routes) will begin at 8:45 a.m. to transport all other OFHS students (not taking OGT or PARCC). 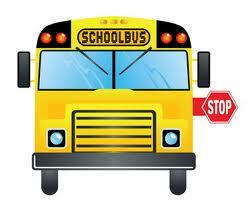 OFHS students NOT involved in testing should plan to be at their regular bus stops at 8:45 a.m. Bus pick-up times will vary based on location with most pick-ups occurring between 8:45-9 a.m. Please note: Polaris and non-public transfer buses will depart OFHS at 7:05 a.m. as usual. 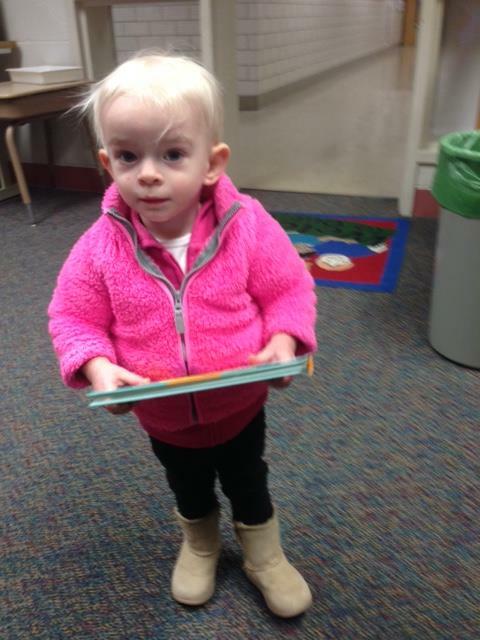 Congratulations to Ava Rose who is February’s ECC Healthy Hero. She is pictured here with her mom Mrs. Janet Guzik and teacher Mrs. Laurie Roberto. The program teaches kids healthy habits, such as eating properly, power washing hands, daily exercise, coughing and sneezing into one’s sleeve and sleeping well. The Hero earns a prize for doing healthy tasks at home, too. March 18, 2015 6:30-7:30 p.m. Representatives from CCBDD will present on eligibility for services and supports for students with disabilities. This program is designed for parents of children with developmental disabilities. Child care is available upon request. Please email Mariel Krakowiak (mkrakowiak@ofcs.net) with the number and ages of the children requiring care. Child care is provided by High School and Middle School Helping Hands students. Child care is located in the sensory room which is near the Media Center. 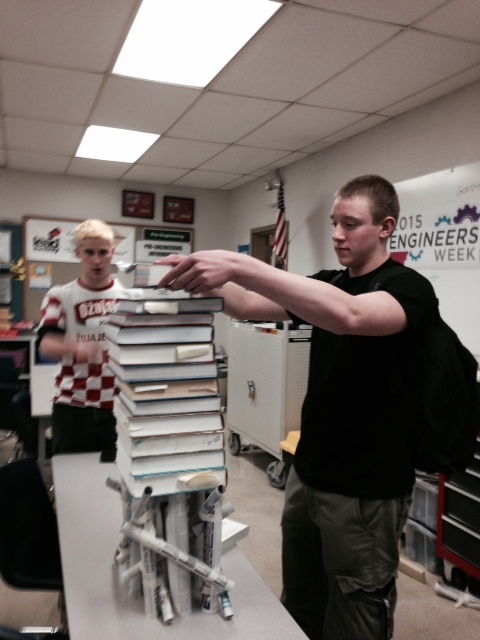 Students in Pre-engineering classes took their talents to the task in celebrating National Engineers Week February 22nd through the 28th. They built newspaper stands, some holding as much as 60 pounds and water crafts powered only by rubber bands. The celebration showed how engineers make a difference in our world, increase public dialogue about the need for engineers and brings engineering to life for students, educators and parents. For information about Engineers Week or engineering in general, click HERE. To view photos of the week, click HERE. The Masquers Parent meeting will be at 7 p.m. Monday, March 16th in the choir room, which is Room W3. OFMS will have a Scholastic Book Fair from March 16th-20th. 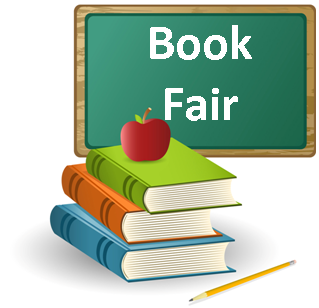 The fair will be open from 8:30 a.m. to 3:30 p.m.
All book fair profits will go toward new books for the school’s Media Center. Students who have placed into College Credit Plus courses based on COMPASS, ACT or SAT scores have two more opportunities to attend ONE group scheduling meeting with a parent. The final two meetings are scheduled for March 16th and 26th at 6:00 p.m. in the OFHS library. At the meeting we will review College Credit Plus in more detail and how the college courses work in a student schedule. Current PSO students need not attend this meeting and will meet with their grade level counselor. For more details, contact Aimee Caldrone, college and career counselor, at 440-427-6152 or acaldrone@ofcs.net. March 18th is College Visit/Job Shadow Day for OFHS juniors. It’s a day to explore options for your future by scheduling a college visit or spending the day with a professional in a career that interests you. To be excused from school for the day, students should fill out and submit either a college visit or career shadowing form by March 13th. Forms may be found in the Guidance office. The ASVAB (Armed Services Vocational Aptitude Battery) will be given Friday, March 20th, at OFHS during OGT week. Students interested in post high school enlistment into a branch of the U.S. Armed Forces should take this assessment. Students may sign up in the high school guidance office. For more information, call the official ASVAB website, asvabprogram.com. Mark your calendars to attend the upcoming OFIS PTA meeting that has been moved from Tuesday, March 17th to Friday, March 20th. It is at 8 a.m. in the OFIS Media Center. Please note this is a morning meeting. Join us for an 8 a.m. breakfast, followed by the 8:15 a.m. meeting. There will be many volunteer opportunities available for the spring “rush” that is soon to come as well as the announcement of the nominees for the Executive Board next school year. The combined meeting of OFIS PTA and Falls-Lenox/ECC PTA previously scheduled for March 17th is now on Tuesday, April 21st. OFIS PTA welcomes all parents of current third graders to the OFIS cafeteria at 6 p.m. for dinner and a tour of the school. Principal Mr. Svec will be there to answer questions. The combined meeting of OFIS and Falls-Lenox/ECC PTAs will follow at 7 p.m.
CAMP INVENTION DISCOUNT ENDS SOON! Students registering BY MARCH 20th will receive a $25 discount. Scholarship funds are available. If you have a financial need, please contact us so we can help you join us at camp. Questions? Contact Camp Invention Director Michelle LaGruth, mlagruth@ofcs.net. Interested in learning more about the application process for the Air Force, Military, Naval and Merchant Marine Academies? Join an informational session on Saturday, April 25, 2015. Horizon Science Academy. 6000 South Marginal Road, Cleveland, OH 44103. 10:00 AM – 12:00 PM. Please RSVP if you are planning to attend by calling an Academy Coordinator at 1-800-205-6446 or 1-888-896-6446 then press 1. Those wanting to tryout for the Golden Bullettes Drill Team should attend the 7 p.m. April 28th informational meeting. It will be in the OFHS Room W-3. Please bring a parent. Safety Town is a child accident prevention program for incoming Kindergarteners. It is a program that introduces safety awareness and preventative procedures to children as they practice real-life situations. Olmsted Early Childhood PTA organizes the program. Class sizes are limited and held at Falls-Lenox Elementary School with hands-on practice. Sessions run in the morning and afternoon during either June 8-12, June 15-19 and June 22-26. For more details see the flyer and registration form by clicking HERE. For those parents needing to designate a single, alternate pick-up / drop-off address for their student for the 2015-16 school year, the deadline for submitting Alternate Transportation Forms will be Monday, June 15, 2015. For additional information and to view/download 2015-16 Alternate Transportation Forms, please click HERE and scroll down to the “About Alternate Transportation Requests” section. Olmsted Falls Athletic Boosters’ Night at the Races is March 21st at St. Demetrios Cultural Center, 22909 Center Ridge Road, Rocky River. All proceeds support the district’s athletic teams. Tickets are $35 a person or $280 for a table of eight. The ticket includes a buffet dinner and refreshments. Contact Terry Atkins, Terence.atkins@saint-gobain.com to buy a horse. For tickets, contact Dave Kurz, 440-263-0051 or dktribe@cox.net. For more details about the event, click HERE. To download a horse form, click HERE. Butter Braid Pastry order pick-up is scheduled for Wednesday, March 18th from 4-7 p.m. at OFIS. All those who placed orders for these delicious treats through Olmsted Falls PTA Council’s annual fundraising sale should mark your calendars for March 18th. The community is invited to attend the Olmsted Community Preschool’s Adults Night Out fundraiser from 6:30-8:30 p.m. Saturday, March 14th. 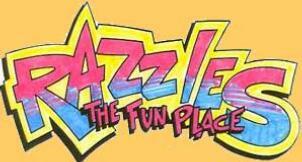 It is at Razzles/Rockers Café, 27128 Bagley Road. The cost is $20 per person. The price includes all-you-can-eat pizza/wings and limited beverages. There will be a DJ, Chinese raffle and more. Tickets are available at the door or contact the preschool office by phone, 440-235-3869, or email ocprschl@aol.com. The Olmsted Community Summer League will offer an in-house registration from 1-4 p.m. THIS SUNDAY, MARCH 15th @ Olmsted Community Center, 8170 Mapleway Drive. If unable to attend, you also may register through the center via online at http://www.olmstedcc.com/. You also may view the league’s newsletter and flyer on that website. This information also is available at ocslinfo.org. Those signing up after March 31st will incur a late fee charge. Registration deadline is April 15, with the season beginning June 1. 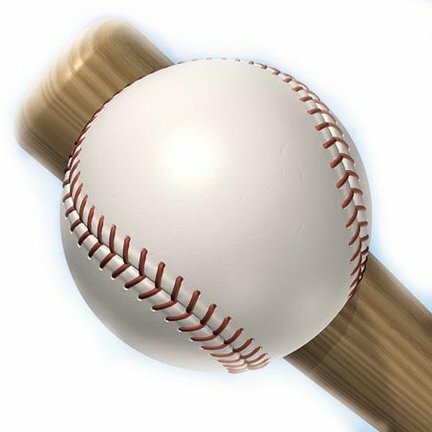 The league also is offering a co-ed adult slow-pitch softball league. You may register as an individual or as a team at olmstedcc.com. Contact the center, 440-427-1599, with questions. 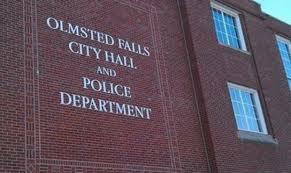 The city of Olmsted Falls’ second Open House is from noon to 4 p.m. Sunday, March 22nd. Residents can meet the administrative staff, City Council members and members of the police, fire and service departments. There will be light refreshments and music. 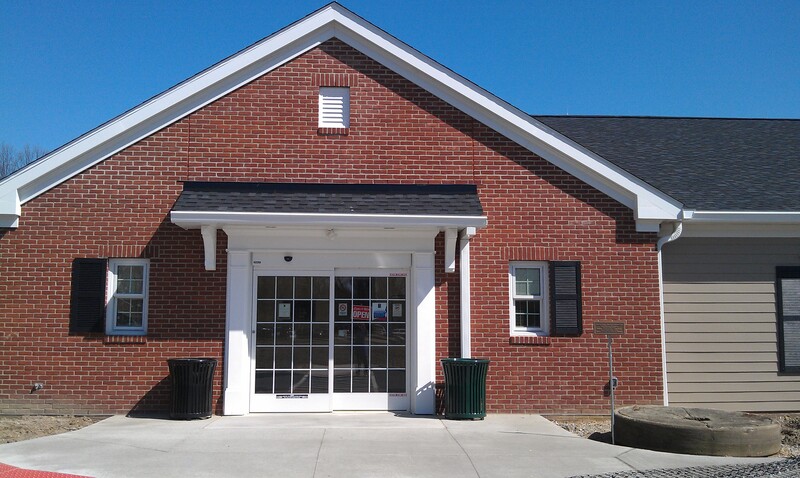 A ground-breaking ceremony will occur at 2 p.m. for the new Senior Center that will be located in City Hall. 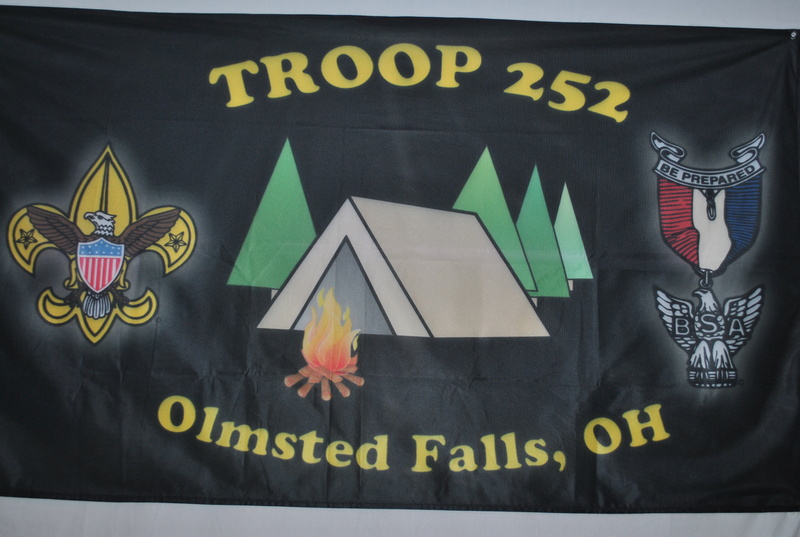 The Olmsted Falls Boy Scout Troop 252 will have its annual Pancake & Sausage Breakfast from 9 a.m. to 2 p.m. March 22nd in St. Mary of the Falls Parish Hall. Donations will be accepted at the all-you-can-eat-pancakes with all the fixin’s. Falls-Lenox kicked off this year’s Right-To-Read Week with an entertaining storytelling assembly that Michelle Todd, children’s librarian from the CCPL’s Olmsted Falls branch, presented. An interactive “Virtual Visit” with author/illustrator Steve Harpster was broadcast onto classroom Smart Boards in real-time, allowing students and teachers to actively participate in his educational and entertaining presentation based on his series of drawing books. Superintendent Dr. Jim Lloyd was one of many special guest readers visiting classrooms throughout the week. The ECC/Falls-Lenox PTA made this year’s RTR Week possible by its generosity and donated time. A special thanks to Jen Vinci, Jennifer Tedeschi, Patty Voisnet and many volunteers including Glen Gardinsky and Anissa Pletcher for a wild and wonderful week. To view the Falls-Lenox RTRW photo gallery, please click HERE. 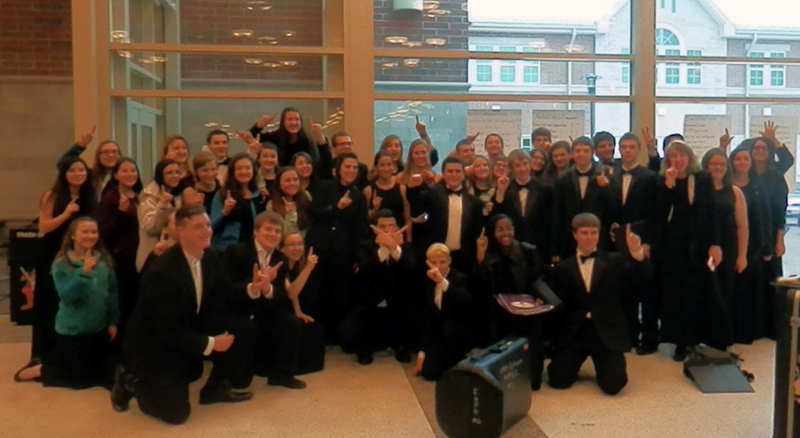 The Bulldog band hit another first this year. 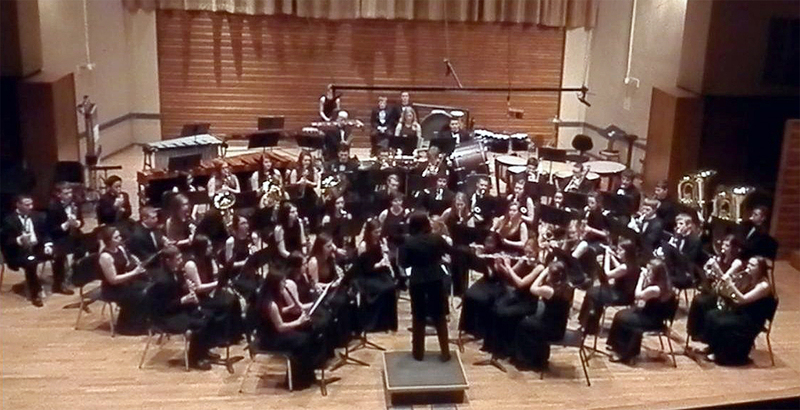 This past Saturday, it was the first high school band to be invited to share the stage with the Baldwin Wallace University Conservatory Band. Under the direction of Mrs. Julie Budd, the band was invited to attend a master class with BW’s Dr. Brendan Caldwell, its Conservatory’s director of bands, and then joined the Conservatory Symphonic Band in the evening. Dr. Caldwell was quoted in his description of the Wind Ensemble: They were “receptive” to his points, “played terrific to challenging pieces” and they are a “powder keg. . . ready to be ignited.” He said the vision of BW Wind Band family is to do concerts with “particular, distinguished high schools from North America.” Olmsted Falls is the first high school in this endeavor. The second high school will be Markam High School from Ontario, Canada. The evening was a very special opportunity for the students and they were very excited to perform on the Conservatory stage. We wish them luck as they head to Large Group Adjudicated Contest on March 14th at Elyria Senior High. The band was featured recently in the Olmsted Dates and Data column in the Sun Post-Herald. To read the column, click HERE. OFHS senior volleyball player Jordan Jaeckin teaches volleyball moves to Angela McNeeley ‘s kindergarten class. ECC classes had special guests during its February 23th Wellness Week. OFHS seniors Jordan Jaeckin and Mallory Bridle, who are in Mr. Ron Goodwin’s Teaching Professions class, taught a lesson about exercise and sports. They did such a wonderful job that ECC is looking forward to continuing this collaboration with Mr. Goodwin and his students. In fact, several of his students are scheduled already to come during Right To Read Week to read in the preschool and kindergarten classes. To view a photo gallery of some of the activities, click HERE. Students had an amazing time hanging out with friends, playing games and dancing the night away at the WEB Lock-in. A special “Thank You” to the parents who donated items for the raffle, the staff who donated their time and for our ROCK STAR WEB LEADERS for such a great year. To view the 2015 WEB Lock-In photo gallery, please click HERE. THANK YOU PTA! $50,000+ IN DONATIONS FOR OLMSTED FALLS SCHOOLS LAST YEAR! Student Awards, Field Trips, Student Social Events, Staff Appreciation, Scholarships, Reflections, Washington, D.C. 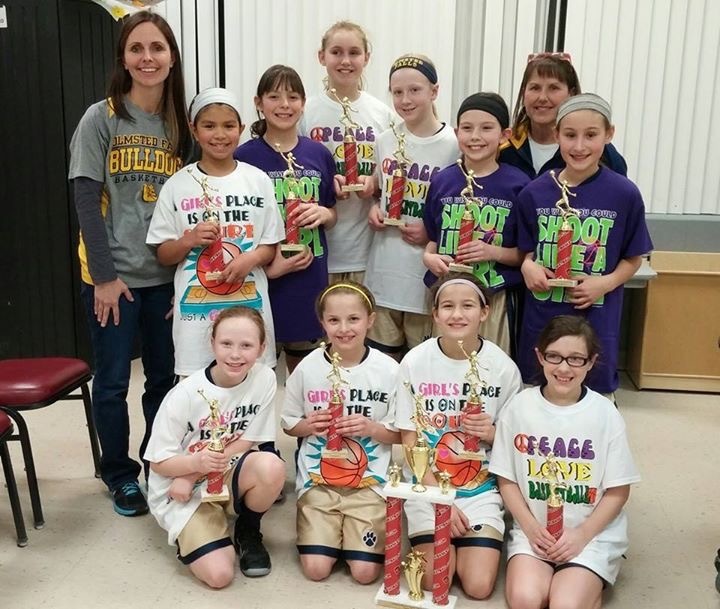 The fourth grade girls Blue basketball team won its 10 league games and five tournaments, including a fourth and fifth grade tournament! Team members enjoyed a perfect record. Coaches Dawn Moses and Kim Urban are extremely proud of the teamwork the girls showed and how they each reached their individual goals. Team members include Kylee Urban, Sydney Moses, Paige Kohler, Mia Kalich, Claire Harries, Ally Kronik, Kayla Bauer, Leah Allman, Kendall Getz and Haley Zgodzinski. Congrats, girls. Special thanks to guest speaker Justin Bachman, founder of Honor Good Deeds, who helped kick off this year’s event with an inspirational speech. Thanks Justin! 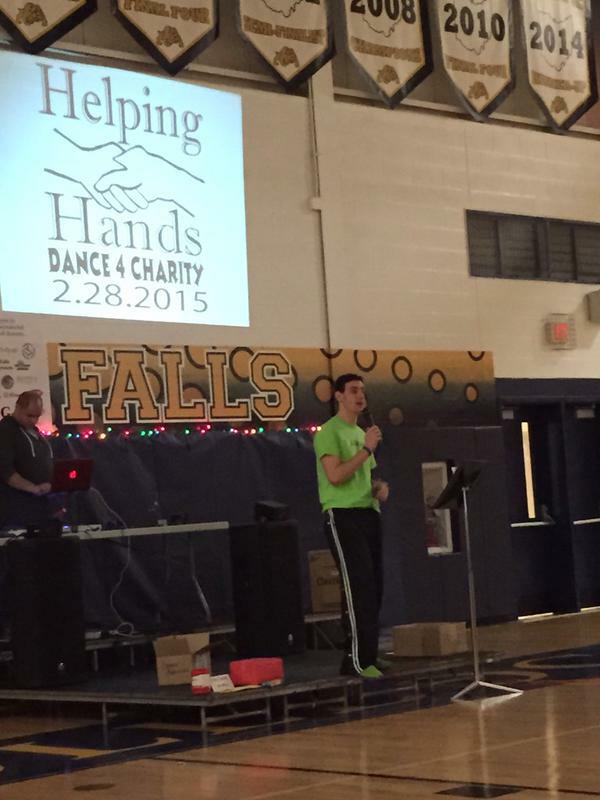 To all who participated, volunteered and donated to Dance 4 Charity, thank you. The total amount of money raised was $12,000! The 14 dance teams raised $9,000 between the four local charities – Connecting for Kids, CTSF, OFCS Special Olympics and The Upside of Downs. Concessions, raffle and general admission collected $3,000 for the organization. Olmsted Falls truly is a caring community. The OFCS special needs families are lucky to be surrounded by such caring families, friends and community, but also making a difference in the lives of other families by supporting events like this one. The community is invited to become a fan of respect and join Helping Hands in an ongoing campaign to stop the use of the R-word and pledge #Respect for everyone. More than 500,000 people have pledged their support online since the campaign launched in 2009. We hope you can join us by making your pledge to end the use of the R-word. OFCS created a video to support the campaign. Please view it and feel free to share it. To view the video, click HERE. Visit http://www.r-word.org/ and take the pledge. Pass the link along to all your friends so together we can create communities of acceptance and inclusion for people with intellectual and developmental disabilities. 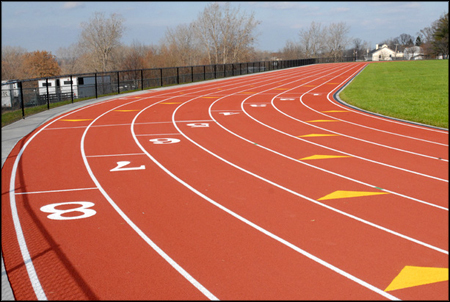 The OFHS track and field parent meeting is set for 7 p.m. Tuesday, March 10th in the high school media center. Parents of athletes who plan to participate in the high school sports should attend. OFMS will have a Scholastic Book Fair from March 16th-20th. The fair will be open from 8:30 a.m. to 3:30 p.m.
Students who have placed into College Credit Plus courses based on COMPASS, ACT or SAT scores MUST attend ONE group scheduling meeting with a parent. At the meeting we will review College Credit Plus in more detail and how the college courses work in a student schedule. Preregistration for this meeting is not needed. Current PSO students need not attend this meeting and will meet with their grade level counselor. For more details, contact Aimee Caldrone, college and career counselor, at 440-427-6152 or acaldrone@ofcs.net.Meetings will be held in the high school library on the following days: March 9th, 2:20 p.m. and March 26th, 6 p.m. Qualified OF students may take a single course or enroll in a full-time schedule at Tri-C while working toward their high school diploma. Many of these classes are TAG – Transfer Assurance Guide – courses, which carry the guarantee that credits will transfer to any of Ohio’s public institutions of higher learning. To view a flyer about the dates and times of the informational nights, click HERE. They begin March 11th. OFHS counselors created a short video to review the scheduling process on how students register through PowerSchool for their 2015-16 classes. To view the video, click HERE. Students will receive practice scheduling checklists and watch the video in their homerooms this week. Scheduling will be available only through Wednesday, March 11. Should a change be required after that time, students must contact their counselor personally for assistance. OFHS counselors will be available through June 10th. Counselors will host extended hours for students and parents on Tuesday, June 9th from noon to 7 p.m. for any final course adjustments. All course changes for the 2015-2016 school year must be made by June 10th. OFHS senior Teresa Wang is in the running to be America’s next Fashion IT Girl. Fashion eCommerce Leaders, ASOS and Fame & Partners are sponsoring the contest.The grand prize winner receives a two-week paid intensive learning internship with Fame & Partners and ASOS in New York AND the chance to design a dream formal dress, made just for the winner ($1,000 value). Runner up prizes are spectacular, too. Click HERE, then scroll down and put in Teresa Wang in the search box to vote for her. GRADE 3 GIRLS SIGN UP TO JOIN GIRLS ON THE RUN PROGRAM BEGINS WEEK OF MARCH 9TH – SIGN UP TODAY! Falls-Lenox is starting a Girls on the Run program for girls in grade 3. It’s a program of learning to play games, make new friends, learn about yourself, become healthier and run a 5K. It is not about running fast. Girls may register through THIS Monday, March 9th. Please click HERE to download a copy of the program flyer. Signups are online at gotrgreatersummit.org. The season begins the week of March 9th and is held on Tuesdays and Thursdays from 2:40-4:10 p.m. The Cleveland National College Fair will be from 1-4 p.m. Sunday, April 12th at the Cleveland Convention Center. The fair allows students to meet and speak with college admissions representatives from in-state and out-of-state colleges. A list of participating colleges is available by clicking HERE. Students and parents are encouraged to preregister for the event at nacacnet.org/ncfstudent. There also will be workshops on ACT and SAT testing, the athletic recruiting process, finding the right college and how to make the most of your college search process. Do you have great school spirit? Why not attend the Golden Bullettes Drill Team clinics and tryouts during the week of May 4-8. The sessions will be in the high school’s main gym. Mark your calendar for this upcoming event. Camp Invention will run from June 8-12th from 9 a.m. to 3;30 p.m. daily. Information is being sent home with students this week! To view the flyer online, please click HERE. Registration is online atwww.campinvention.org. Students registering BY MARCH 20TH will receive a $25 discount. For anyone who may have missed the sale, and is still interested in purchasing Butter Braids to serve at your upcoming spring events or as a special treat for your family, last-minute orders may be submitted BY EMAIL ONLY THROUGH NOON THIS MONDAY, MARCH 9TH. Please email final order directly to triciao70@hotmail.com by noon on Monday. Checks should be made to Olmsted Falls PTA Council. 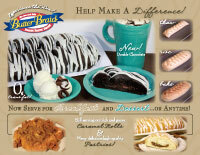 Click HERE to view a flyer and order form. Please contact Tricia Vidovich, 440-785-9965 or triciao70@hotmail.com with questions. Proceeds from this sale go toward OFHS senior scholarships and PTA Council activities. The group earns 40% profit on each item sold. OFIS ANNUAL MALLEY’S CANDY SALE IS ONLINE! The Olmsted Falls Intermediate School’s Malley’s Chocolates sale, which runs through March 30, is accepting ONLY online orders this year. A website is available specifically for OFIS. To connect to this site, click HERE and share it with family and friends. The OFIS registration number is 4634. All orders totaling $60 receive free shipping to one address. All purchases made on the site will directly benefit student activities at OFIS. 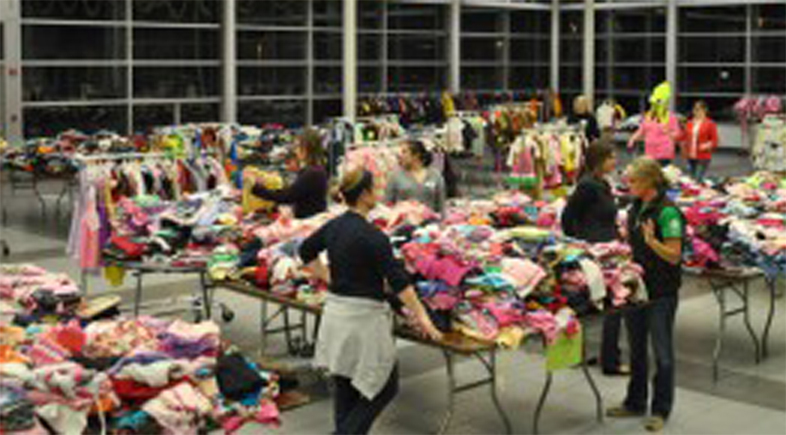 The popular OECPTA’s Bargain Bonanza is March 7th at OFMS. This children’s resale is a tag sale. This consignment-style resale offers great deals on children’s clothes, toys, baby gear, maternity wear and so much more! For more details about the sale, click HERE. 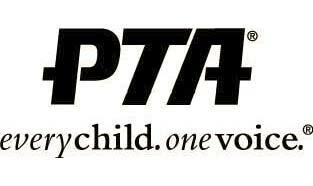 The PTA’s website is oecpta.org. A Mexican feast awaits the community at the March 7th Taco Night at Tony K’s Bar & Grille in Berea. This fundraiser benefits the Class of 2015 Post Prom event. Tickets are $20 for the event that runs from 8-11 p.m. The night includes raffles, baskets of items to raffle, auction gifts and 50/50 sideboards – to name a few. Enjoy a fun night out and help support the Class of 2015. For tickets or questions, contact Heather Fritz, 216-513-7372. Olmsted Falls Athletic Boosters’ Night at the Races is one of its biggest fundraisers of the year. All proceeds support the district’s athletic teams. It is March 21st at St. Demetrios Cultural Center, 22909 Center Ridge Road, Rocky River. Tickets are $35 a person or $280 for a table of eight. The ticket includes a buffet dinner and refreshments. The community can help in raising funds for the March 15th event by purchasing a ticket to attend or buying one or more horses. Everyone, whether an individual, civic groups, clubs or businesses, may participate. There are 90 horses available to buy. If your group wishes to buy all nine horses in a given race, contact us ASAP. We will make that happen. Attention aspiring writers! Engage in some quick and fun writing activities to get your creative ideas going with author and editor Rhonda Helms.The program is for grades 6-12. To sign up, click HERE. Girls ages 8-18 are invited to participate in skills clinics this month to get ready for the upcoming Olmsted Girls Fast Pitch season. The first one is March 7, focusing on pitching. Coaches and members of the OFHS varsity team, Batting Coach Gary Saunders and members of the Baldwin Wallace University’s team will be on hand to offer instruction and work with the players. To see a flyer detailing the clinic and dates, click HERE. Online registration is now available for the summer baseball/softball leagues for boys and girls ages 4-18. Sign-ups are at olmstedcc.com and a form is available by clicking HERE. You may also print the forms from that website or the Olmsted Community Summer League website, ocslinfo.org and return the form with payment to Olmsted Community Center, 8170 Mapleway Drive. There is a late fee for those who register after March 31. Games begin June 1st.